Akron, OH – Zing Anything, the leading provider of active water infusion bottles, is making it easier than ever to stay hydrated with its new Zingo Clear lineup. Featuring a lightweight, compact, and leak-proof design, the 22oz BPA-free Zingo Clear is ideal for tossing in a gym bag, backpack or purse. 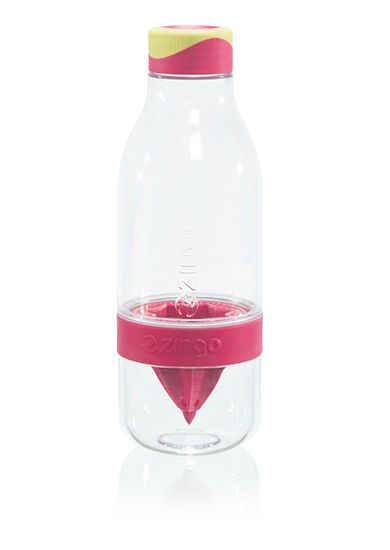 Like Zing Anything’s popular flagship product, the Citrus Zinger, the Zingo Clear features a citrus press that squeezes fresh fruits directly into the water bottle to extract more nutrients and flavor than other passive infusing methods. By harnessing the energizing benefit of citrus, Zingo Clear removes the need for sugary or processed drinks. Ice can be added via the bottom opening and the citrus press is removable and easy to clean. Designed in the USA and dishwasher safe, the Zingo Clear is available online and at retailers nationwide for an SRP of $12.99 in three refreshing colors: pink, green and blue. Click here to learn more about Zing Anything’s complete lineup of flavor infusers, including the Citrus Zinger Biggie, Citrus Zinger Mini, Citrus Zinger Sport, Aqua Zinger, and Kid Zinger. Also available is a Salad, Tea and Vodka Zinger and a Zing 54 pitcher. Founded in 2012 and headquartered in Akron, OH, Zing Anything strives to create innovative and simple-to-use tools that harness the power of natural ingredients. By extracting the flavors and nutrients of ingredients and infusing them directly into the bottle, Zing Anything hopes to make it easy (and fun!) for consumers to move away from unhealthy beverage choices and discover the limitless possibilities that nature has to offer. For more information, visit www.ZingAnything.com and find @zinganything on Facebook , Twitter, and Pinterest.